Wavelength is a serious cruising yacht well built and well looked after by here experienced offshore cruising owners. She was Hull no 5 out of the Mastercraft marine yard being launched in November 1993. She has recently completed a 5000 Nm cruise up and down the east Coast with her cruising couple owners in complete safety and comfort. A continuous program of maintenance and updating has seen this yacht kept up to date in all areas including electronics, mechanicals, rigging and creature comforts. March/April of 2016 saw her rig removed and fully refurbished with sandblasting and repainting of her spars, brand new standing rigging and fittings, new running rigging and rewiring of all mast electrics plus new nav lights and LED deck lights. The spars were sandblasted back to bare alloy and primed and repainted in 2 pack white epoxy to ensure many more maintenance free years. All her hydraulic sail handling fittings were removed and overhauled including the main powerpak and mast furling gearbox. A brand new Harken headsail furler ensured much easier headsail handling and control making sail handling for her husband and wife crew, is fast and easy. Wavelength has the classic 4 cabin layout favoured by families with 7 large berths and 2 large heads, one port and one starboard. The large airy pilothouse affords a safe and comfortable cabin when on a long passage out of the weather and its internal helm station means night watches are kept in safety, warmth and comfort inside, no matter what the weather. Short handed sailing is very easy for just 2 crew and we have been able to do long, non-stop passages with ease. We recently sailed Gold Coast to Pittwater in 52 hrs with a husband/wife crew. She has the factory fitted heavy duty davits easily carrying the 3.1m RIB with 9.9HP outboard fitted. One davit supports the 45cm TrackSat fully tracking satellite dish coupled to a VAST box with over 100 free to air channels available up and down the entire east coast of Australia. Davits have been sectioned and hinged to give an overall length no greater than 15.0m to fit into many marina berths (legally). Her electronics are all current Raymarine fully integrated to autopilots. A Class B AIS transceiver and 4KW colour radar ensures maximum safety and visibility when cruising offshore and her mast mounted VHF antenna with low-loss cable ensures her AIS signal is transmitted strongly allowing friends and family to track you all the way up the east coast with the appropriate app. Redundancy has been built into many of her systems with a backup autopilot, spare plotter, spare VHF and HF antennas. A WiFi router with external masthead 4G antenna gives excellent internet coverage and allows multiple devices to have internet access throughout the boat. A spare 4G antenna is mounted on the davits. The main Raymarine plotter also has WiFi connectivity allowing separate control via an iPad (not included). The 12 Volt electrical system has been completely reworked in 2015 and a new bonding system installed to all hull fittings. New circuit breakers, extra House 2 battery bank and new Inverter /Charger have recently been fitted. The 100 HP Yanmar engine has been refitted with 2 x 120AMP smart alternators with separate smart regulators. Pulleys and belts were also changed to handle the extra power load. The 2 separate house battery banks (1 x 300 AH and 1 x 360 AH) are easily recharged by either the engine alternators, separate 80AMP or 50 AMP battery chargers (shore power or genset) OR the 3 solar panels (2 x 120W, 1 x 180W). These also recharge the main engine and thruster batteries. The 1500W inverter easily provides the 240V power for TV, satellite antenna, laptops, phone chargers and the Nespresso machine whilst at anchor without needing to run the genset.
. The saloon and 2 forward cabins are airconditioned with 2 separate systems (1 x 16000 BTU and 1 x 10000 BTU reverse cycle) and both can be run off the genset at anchor. A separate large 240V oscillating fan can be run off the inverter as well. A full set of snap-on window covers is also included to help with sun load on the pilothouse at the height of summer. There is a zip-in cover between the dodger and Bimini plus zip-on side covers to protect the cockpit in heavy rain.. The cockpit table and pedestal were upgraded to Mark II version keeping the up to date look of the yacht. A 6 person liferaft (new 2014) stows into the large cockpit locker and 2 other smaller lockers hold spare sheets and lines. The cockpit has 3 strong harness points and there is a manual bilge pump below the helm plus another manual bilge pump accessible in the aft Stb nav station. 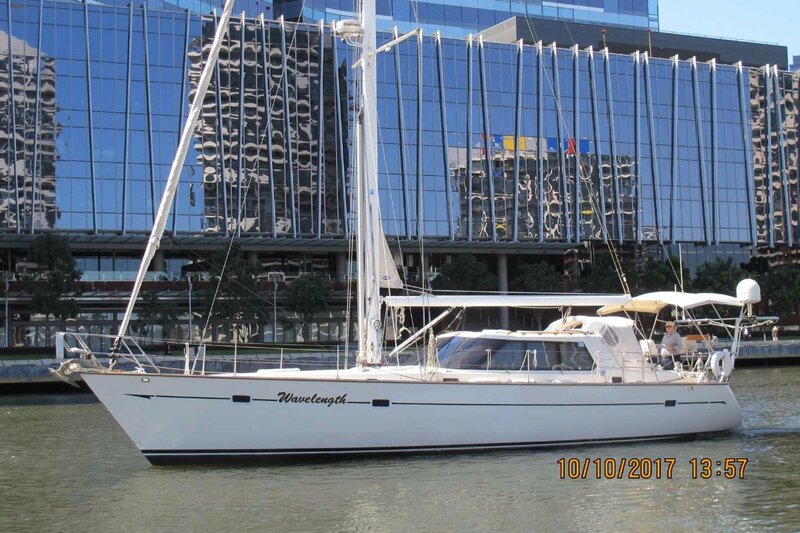 Also available for sale including marina berth lease at Yarra Edge Marine (Melbourne) until 2030 for additional $55,000. 4JH2-UTE Turbo charged/intercooled 4 cyl diesel. Single shaft, 3 blade feathering propellor. 1000 litres in 2 tanks, port/stb wiht separate deck fillers. YAMAHA 9.9 HP 2 stroke. Full window and hatch covers. New dodger 2016, Bimini with infill. 4 separate cabins with 7 berths. 2 x dbl, 3 x sgl bunks. 3 showers, 2 x H/C, 1 x transom. FUSION AM/FM radio, DVD player interfaced to digital TV. TrackSAT satellite TV receiver with VAST box for Free to Air channels (over 100). Full east Coast TV coverage. 4G WiFi Router for wireless internet throughout boat. 1 x 16000 BTU (saloon), 1 x 10000 BTU (fwd cabins) both reverse cycle. Central galley with 2 burner Broadwater stove and gas oven, 240V microwave, pantry, plenty of storage space, Nespresso coffee machine. Eutectic Fridge with both 240V and engine driven compressors. Eutectic top loading, large freezer with baskets. Runs from 240V or engine driven compressors. Broadwater 2 burner with gas oven, gimballed. No; but plumbing installed to accept one. 45 L hot water with 240V and engine heating. Muir CHEETAH anchor winch. Manson 80 LB ploough anchor. 100 M Galvanised "L" grade chain. 4 x electric wiht float switches, 2 x large manual. 4 x 1 KG dry powder extinguishers, 1 x 5 Kg foam. Onan 6.5KVA genset. 2 x House batteries (1 x 300AH, 1 x 360 AH - new 2016), 2 x new engine batteries (2019), 1 x genset batteries (new 2016), 2 x bow thruster batteries (new DEC 2018). 2 x 80W solar panels, 1 x 180 W (new 2016) solar panel with separate regulators, engine fitted with 2 x 120AMP alternators both with Smart regulators. 1500W Victron Inverter-charger wiht 80AMP charger (House 1 & engine batteries), separate 50 AMP battery charger (House 2). Victron battery monitors for each house bank. Raymarine E127 12" plotter with 2017 Navionics charts. Raymarine A75 plotter at outside helm, ST60 Wind/Depth/Speed, ST6001 Autopilot (electric ram), ST6000 pilot (hydraulic), 4KW Colour HD Raymarine radar, GME Class B AIS transceiver, ICOM M504 VHF radio with DSC and Command Mic at helm, ICOM M800 HF radio with auto tuner. Shatz 6" Brass Ship Clock (mechanical) and Shatz barometer. 1 x inmast furling HOOD main, 1 x spare (old) main, 1 x furling HOOD genoa on new Harken furler (2016), 1 x MPS in sock, 1 x storm sail (separate mast track), 1 x storm jib for inner forestay. All new March/April 2016 standing and running rigging. Mast & boom removed, sandblasted and painted, mainsail hydraulic furler rebuilt with new seals and bearings, new mast electrics, LED nav lights LED spreader lights, LED anchor light, new masthead VHF antenna. Mast setup with optional running backstays. 2 x Main Barient hydraulic winches, 2 x secondary Barient manual cockpit winches, 2 x mast mounted manual sheet winches. Hydraulic winches and furler controlled via switches at helm pedestal, safety cutoff switch at helm. Wavelength has been continuously maintained and updated under the current owners ensuring all systems work for worry-free cruising. There are many backup systems throughout the boat especially the electrics where charging of batteries has been well designed and thought out. The boat is setup for a husband and wife cruising couple to enjoy long periods away cruising and the boat is easily handled by 2 in all weather conditions day and night. Quality electronics and nav gear ensure safe and happy cruising anywhere around Australia and Buizen 48's have ventured across many oceans offshore and around the world. This boat will take you safely and comfortably to any destination you choose.